Moderated by Detlev Johnson of Position Tech, this panel included: Stephan Spencer of NetConcepts, Rick Klau of FeedBurner and Amanda Watlington of Searching for Profit. First up was Amanda with yet again, a unique presentation. There is still lots of unclaimed territory with blogs. Less than 6% of Fortune 500 companies are blogging according to SocialText. 35% of companies plan to start a blog in the next year. RSS distributes content and drives traffic. Poll of the audience: Large part of the audience does search optimization, so how do you optimize a blog? Use plugins to increase functionality of WordPress and Moveable Type. Optimize the content and do what you would do with web site optimization. 1. Write your post. Focus on your message. Amanda recommends publishing a blog as a separate site to become a link authority. Next up is Stephan Spencer of NetConcepts – “Optimize for blog a feed search engines”. IF you tag with a certain keyword phrase often, you will often rank well for that phrase. Rick offers a perspective from a service provider point of view. FeedBurner is the world’s largest manager of feeds. What’s New in the past six months. – IE7 will affect how many people are aware of feeds, It will recognize the autodiscovery tag. That means sites with a RSS feed might have a slight visibility advantage. – TechMeme shows a tren in mem tracking, favoring full text feeds. Technorati will now give users the ability to use 301 redirects, There is a SEO advantage to this but a tracking accuracy disadvantage. 302 redirects which will do a better job of tracking will still be available. Full text matters because it includes links. Use full text links so news services like Techmeme can undestand and reward your posts. Having links within the feed post will dramatically increase your feed awareness. Ping – FeedBurner offers PingShot or you can use Pingomatic. When IE7 ships, then 80% of the browser market will be able to recognize feeds. 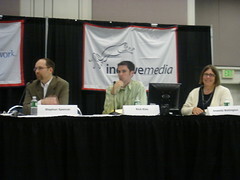 For full coverage of Search Engine Strategies San Jose 2006, be sure to visit Search Engine Roundtable. Thanks for a great write-up… minor clarification though: I run Publisher Services for FeedBurner, not Technorati. Hey Rick, great session. Sorry for the mixup, it’s been fixed. Too much T’rati searching in one day I think. Lee – thanks for taking the effort to blog all of this. I’ve implemented many of these tips but there are some new useful ones. I just created a post on a feed icon library to encourage readers to subscribe more easily. I find that while SEO is important, it’s unique and pertanent content that drives my traffic. Chad H.